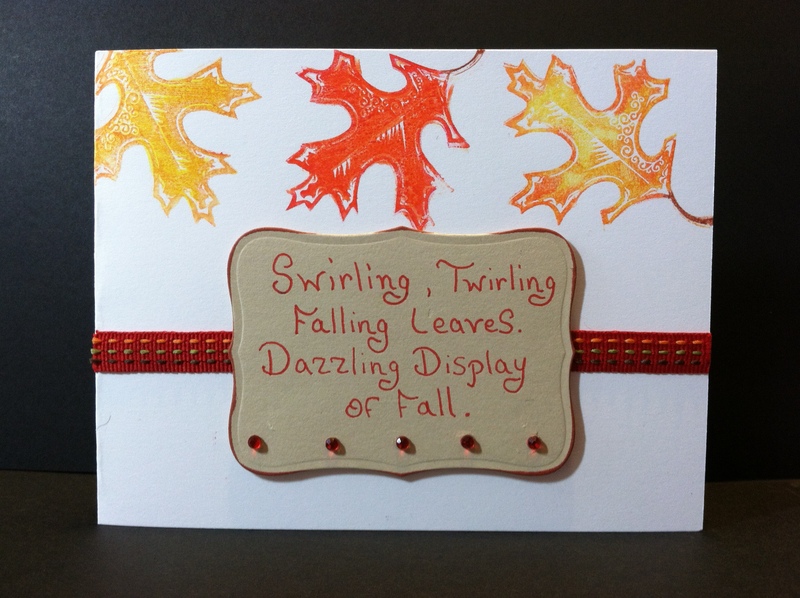 I created a quick set of Fall cards this morning. The longest part of the whole process was when I rewrote one of the tags 3 times because, I hate the way my handwriting looks. In the end I just had to accept the fact that I never got an A in penmanship for a reason. 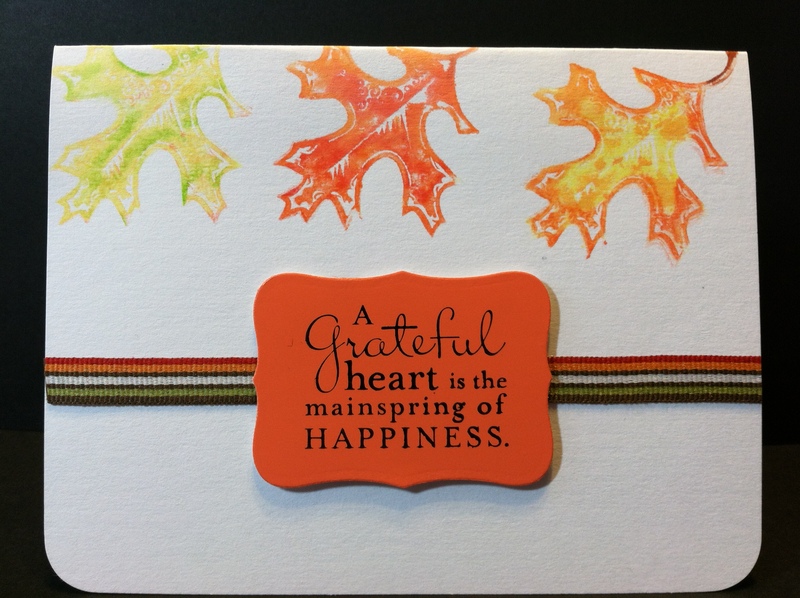 I used the Stampin’ Up Pursuit of Happiness stamp set for the sentiment on this card because, I just couldn’t stand to see my ugly handwriting on another card. LOL I cut out the Nestabilities tag from a paint swatch and then I stamped onto it with StazOn ink. I love the the sheen of the paper as well as the color. 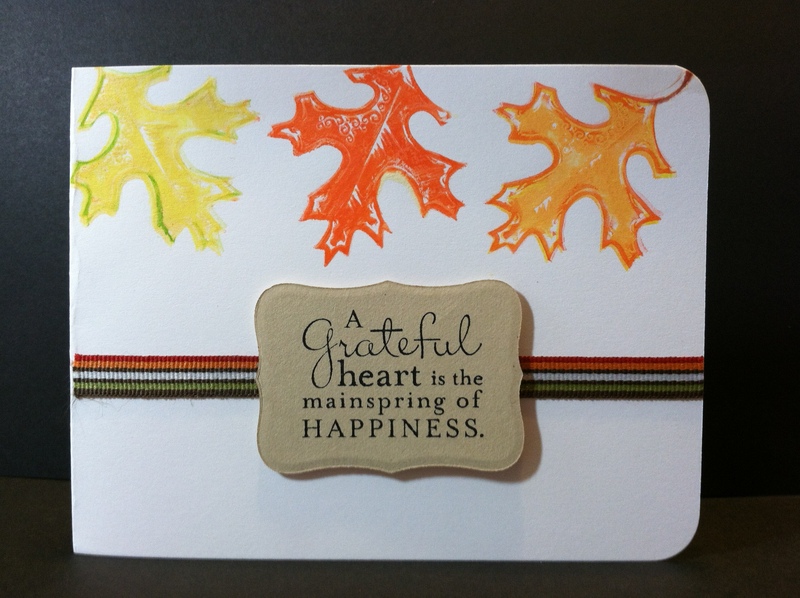 Here is another card I made using the Inkadinkado Autumn Leaves stamp the I bought at TJ Maxx. I am not normally a TJ Maxx shopper but another blogger alerted me to the fact that they have stamps and punches there for very little cost. This chartreuse tag is a paint swatch sample too. I like the way it contrasts the soft reds, yellows and oranges on the rest of the card. I made one final card with a kraft paper sentiment. Although I think it looks nice, I think I would use raffia or twine next time instead of the ribbon. I think an orange colored Baker’s Twine would work well too. Posted in Any Occasion, Thank You and tagged Autumn Leaves, Inkadinkado Autumn Leaves, Stampin' Up Pursuit of Happiness. Bookmark the permalink. You get an A in being a husband! I would know that handwriting anywhere. Same w’s as always.